People ask me all the time how I make such vibrant watercolor splashes in my bullet journal. Well, today I’m going to spill the beans! I’ll show you four easy watercolor techniques for your bullet journal that require no skill or expertise. These are perfect for headers, backgrounds, or whole pages if you’re feeling froggy! So what could these super simple techniques possibly be? You gotta make sure you’re using a journal that can take a beating. I have used a number of journals that are great with watercolors, but there are some cheaper brands out there that will kick up a fuss and leave you feeling frustrated. I recently gave the Moleskine and Leuchtturm1917 journals a watercolor test (which you can see here). While the Moleskine could roll with the punches okay, it wasn’t as robust as a Leuchtturm1917. I also recently tested the durability of the Rhodiarama softcover journals, and they did remarkably well. Whatever journal you use, make sure you do a test on the last page before you try a real page in your planner. You’ll feel more confident and get a better feel for how your paper will handle the watercolor. As this is easier to show than tell, I’ve created a little video for you! I bet that was a ton easier than you thought it would be! The only trick to nailing these gorgeous watercolor techniques for your bullet journal is to simply have the right kind of journal and keep some paper towels with you. After that, it’s easy to play around and get different colors, textures, and saturation levels. Make it bold and bright or soft and dreamy. Go with some salty starbursts or plastic wrap crinkles. You will love how easy it is to turn a blank white page into a vibrant splash of color with watercolors. 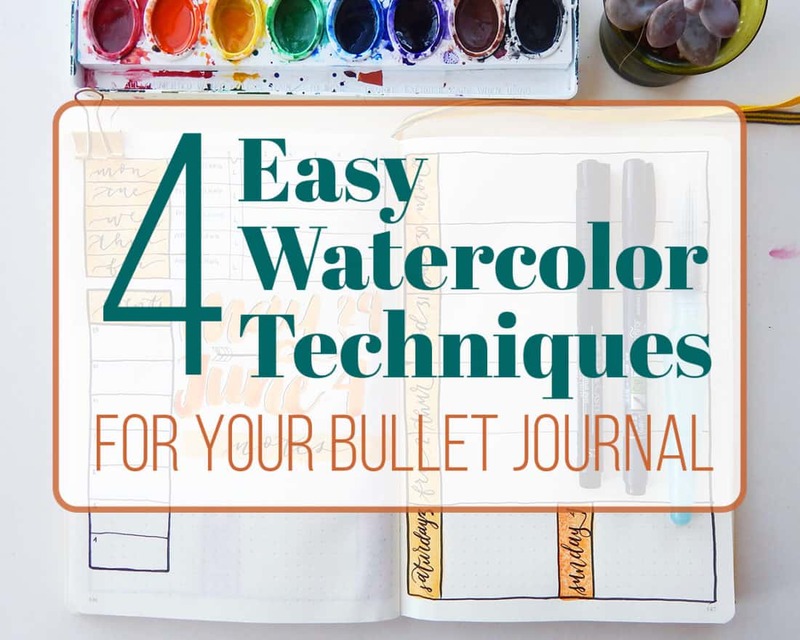 Now that you know how quick these techniques are to accomplish, go out and try them for yourself to create your gorgeous, colorful bullet journal! Do you have any tips for not getting the pages warped/crispy? I usually tape two pages together, but it bothers me whenever I write in my bujo because of the waves. Thank you so much! You have an awesome website! The pages will warp some when you use watercolor. One option would be to journal in a watercolor notebook as the pages are the least likely to change from the watercolors. It’s something that unfortunately can’t be avoided 100% but I sure hope that doesn’t stop you Karina! Ok. I am journaling for about one and a half year and like your blog very much. Some things you do are totally up my alley, others I do totally different. I adore washi tapes and Post Its, but I am an absolut loser in the ways of drawing. My bullet is, after some bumps in the road, a x-17. For me its fabulous. 4 parts, adresses, short Calendar, many many Post Its and a place to journal. And all the essentials stay when I change the Journal; they have many different kinds of notebooks and formats. Its atypical, but perfect for me. Just like you said, my bullet journal is ME! I prefer the STABILO Felt-Pens… Up to 45 Colors and different tips, some even erasable. Marvellous. Thanks and have much fun! That’s so great that you’ve found what works for you Antonia! That’s the beauty of bullet journaling, isn’t it? Enjoy! Sorry to hear the video isn’t loading for you, Allison! I have just checked things on my end and it seems to be working properly. You may want to close out the webpage and come back to it. That may do the trick for you. Thank you, Shelby! I’ve been trying to add some watercolor touches to my bujo. I learned more from your great video than any other place. Very informative! I’m super excited to try each of these techniques!! Rock on, Tami! It’s always a bit nerve-wracking at first, but the reward is oh so worth it. I’m so glad you’re jumping in and giving it a try! At the end of your video, how do you leave white space protected from the watercolor bleeding into it, too? For instance, the day boxes for your monthly spread are still white. But the entire page behind the boxes are watercolored. How did you prevent bleeding? That effect looks really neat! Thank you for this awesome tutorial! You are right! Super easy techniques! The paper actually does a good job of not letting the watercolors wander. With my water brush pen, I have some sharp control over where the watercolor goes, and it typically just sits on top of the paper until it dries rather than sinking in and bleeding. I’m sure it depends wildly from journal to journal due to paper types, but it’s pretty easy to keep the white spaces clear of any bleeding. I hope that helps, Zoe!